November 21, 2014 – The Dressage Foundation is pleased to announce that the inaugural Carolyn Van Cise Memorial Sportsmanship Fund Grant has been awarded to young rider Monica Stanke of Williamsburg, Michigan. Monica intends to use the $500 grant to attend the 2015 Global Dressage Forum North America. 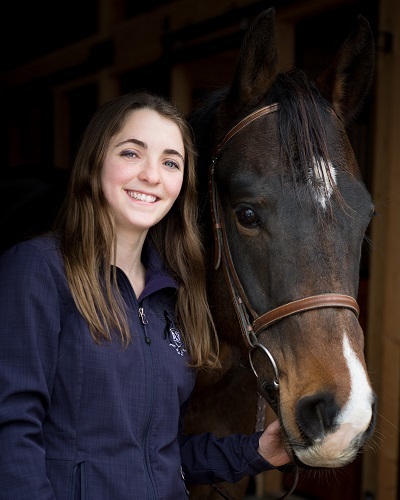 Monica, a high school senior and member of Michigan Dressage Society, plans to become a professional dressage trainer. "When I was notified that I had been selected to receive the Carolyn Van Cise Memorial Grant, I was pleasantly surprised and honored. This grant will allow me to participate in an incredible opportunity, in which I will be able to learn a lot and use to further my dressage career." The National Selection Committee, made up of dressage professionals from different areas of the country, agreed that Carolyn would have loved to support a young rider such as Monica. Carolyn was active in Michigan’s dressage community for many years as a trainer, instructor, judge, and mentor. Dressage was her passion and she served as a role model for those she knew. The Carolyn Van Cise Memorial Sportsmanship Grant is awarded annually to a Junior/Young Rider who is a current Michigan resident and best exemplifies the qualities that Carolyn found most important in life, including exhibiting the characteristics that demonstrate positive sportsmanship principles. Recipients of this grant will receive $500 to be used towards expenses associated with attending a specific educational eventing or dressage event of their choice.